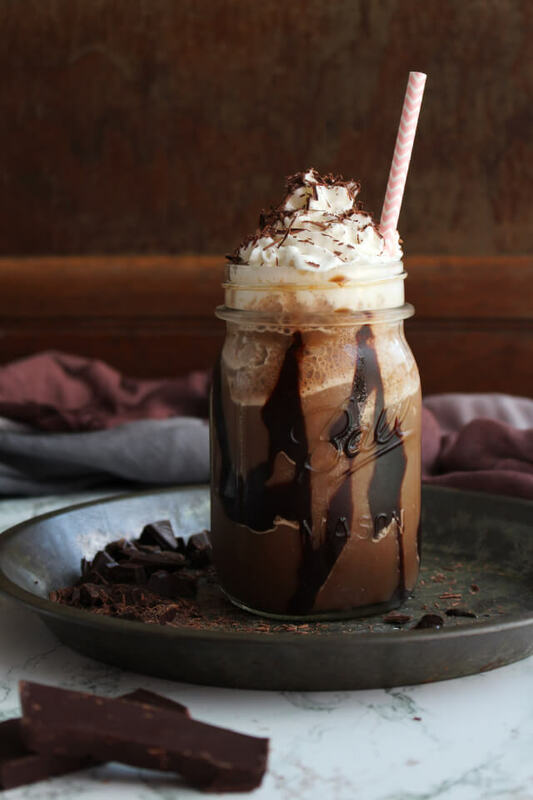 A Frozen Dark Chocolate Mocha is a coffeehouse favorite that you can easily make at home with just a few simple ingredients. You will want to make one of these frozen treats every day! Want to know a little secret? I haven't always been a coffee drinker. I've always loved the way it smells, but as for drinking a cup every morning? I could take it or leave it. Then my college years came along. That's when my love for the coffee bean began to blossom. My friends and I would have marathon study sessions that, naturally, required copious amounts of coffee. We would stop at the coffeehouse before hitting the books and pick up the biggest size coffee they offered, always prepared the same way -- iced, light and sweet. Over the years, my admiration for the coffee bean has grown into full-blown love and my morning coffee is something I look forward to every day. 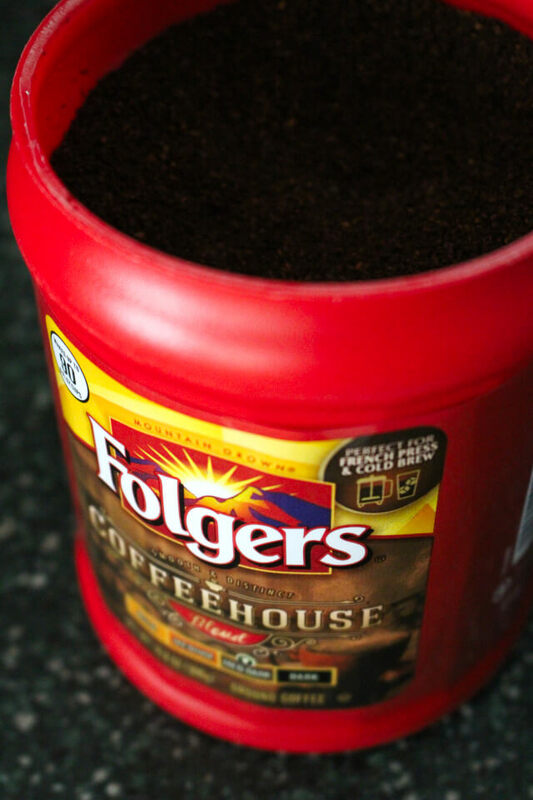 The best part of waking up is Folgers in your cup, right?! After years of drinking all kinds of coffees and blends, I've definitely departed from my light and sweet coffee cravings and developed a taste for dark varieties. I think that's why I love Folgers® Coffeehouse Blend so much. It's a medium-dark blend that is smooth, bold and new to Publix! The Coffeehouse Blend delivers a bold coffee taste that is perfect for incorporating into the cold coffee drinks that I grew to love so much during my college years. Think cold brew, brew over ice, and frozen drinks. This smooth blend is perfect for all of them! I am particularly fond of frozen drinks, so that's what I decided to make with the new Coffeehouse Blend and soon as I got it home from Publix. I'm also big on dark chocolate, so I paired it with the coffee knowing it would be a winning combo. So, let's talk about this lush frozen drink I made here. First, we'll address the consistency. This is going to be a slushy, icy drink. Some store bought varieties of frozen drinks have additives that make the frozen drink somewhat smoother and creamier. If that's what you're going for, try adding a frozen banana or a scoop of protein powder to the mix before blending. Second, we have to talk about the temperature of the Coffeehouse Blend coffee. 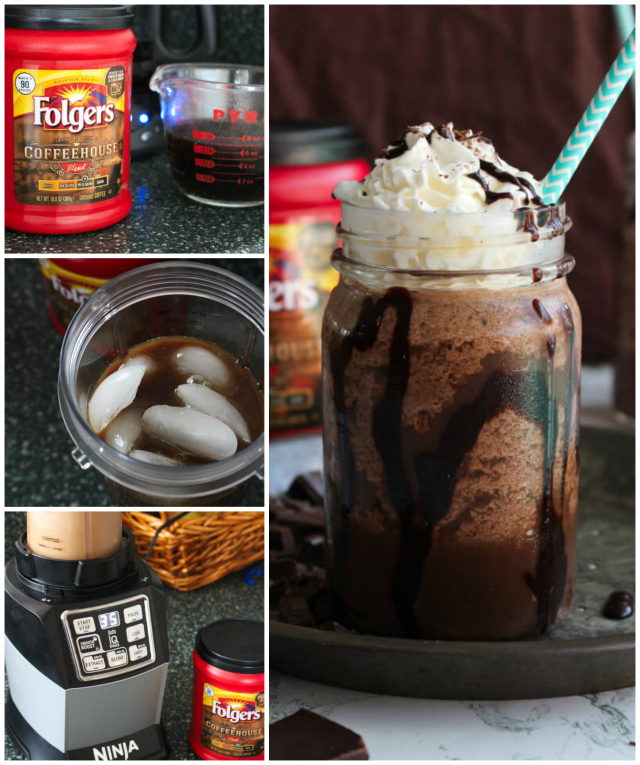 This recipe will only turn out well if you prepare the drink with completely cooled coffee. The colder, the better. A cold brew would be ideal, but a leftover cup of joe put in the freezer for a bit works just fine. Just make sure it's not hot! Third, it's important to note that every blender performs differently. You may need to double blend, add a little more ice, or add a little more almond milk to reach your desired slushiness. Tweak it a little at a time until it's just right for you. And if you end up with a watered down drink instead of a frozen one because you went a little crazy with the tweaking (which can happen! ), just throw some ice cubes in that baby and call it an iced coffee. Finally, you'll notice my recipe calls for honey as a sweetener. I love to use honey and maple syrup as sweeteners when I cook and I add just a little so it's not too sweet. If you like your frozen drink a little sweeter than I do, try adding a few tablespoons of chocolate syrup to the mix before blending. It's not quite as healthy, but it will give you a little extra sweetness if that's your thing. I love this Frozen Dark Chocolate Mocha just the way it is, though. 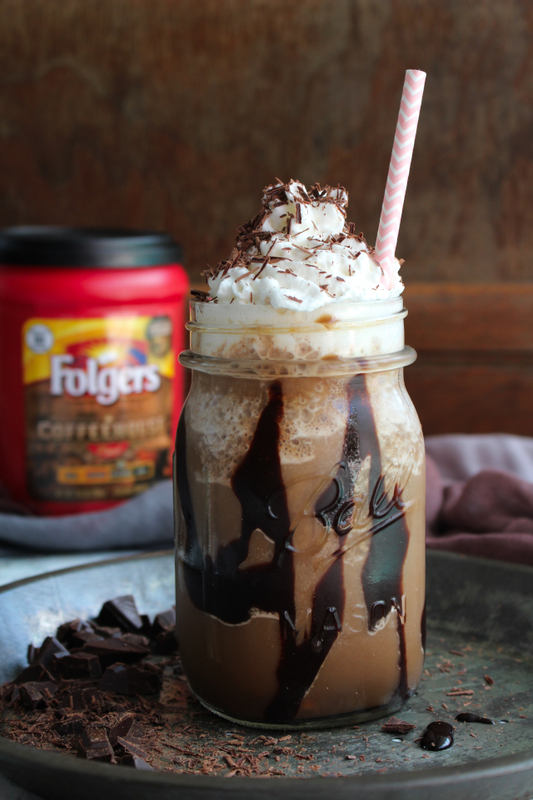 So, how will you take your Folgers Coffeehouse Blend? Hot, iced, or frozen like me? I have a feeling that no matter how you drink it, you're going to love it. 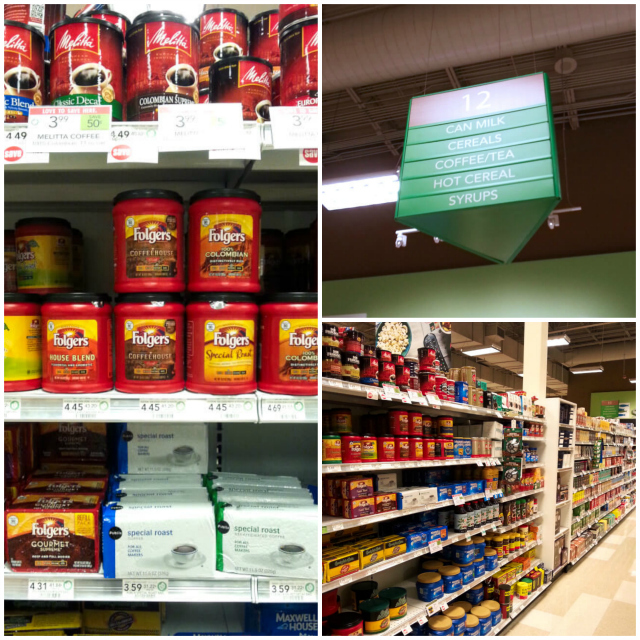 Stop by Publix and check it out and don't forget to follow along with Folgers on Facebook and Twitter to stay in the loop of all things coffee! 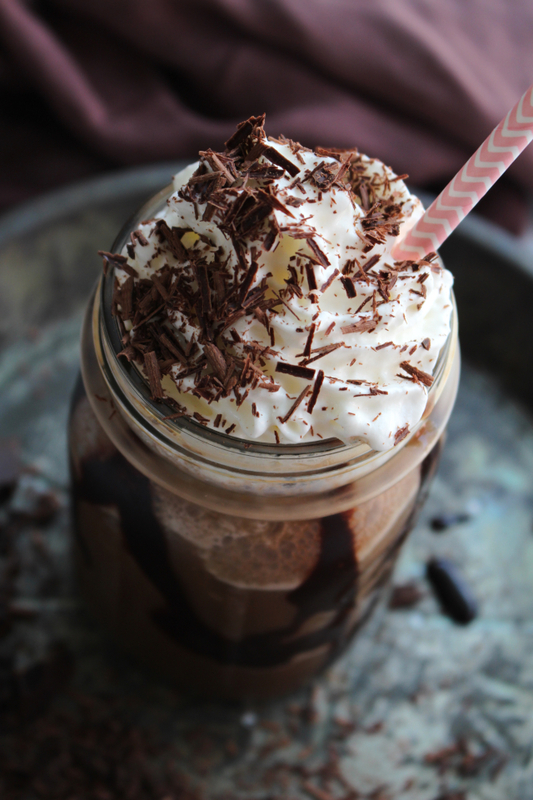 Blend the coffee, dark chocolate almond milk, honey, vanilla extract, and ice until thick and slushy. Add a little more ice or almond milk to reach your desired consistency. For dark chocolate shavings: Freeze a dark chocolate bar, then use a potato peeler to make the shavings. For this recipe, the coffee must be cooled completely before adding to the rest of the ingredients. Putting it in the freezer for just a bit makes quick work of cooling it down. Join the conversation on social media by using the hashtag #CoffeehouseBlend!